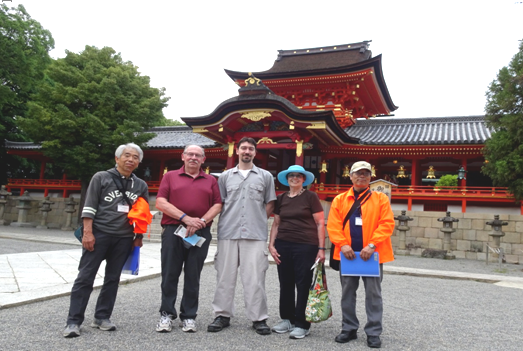 English Guide for "Iwashimizu Hachimangu"
Yawata Tourist Guide Association started the English guide for “Iwashimizu Hachimangu” to foreign tourist from February this year at no charge. “Iwashimizu Hachimangu” was built in the Heian period about 1,200 years ago by the order of Tenno, Japanese emperor. It is one of the three major Hachimangu in Japan. “Iwashimizu Hachimangu” was designated National Treasure of Japan in 2016. Local volunteers will show you in Engli sh, including the Shrine of National Treasures, the Otokoyama lookup point, the Edison Monument, and the Kora shrine at the foot of the “Iwashimizu Hachimangu”. If you would like to have the English tour of “Iwashimizu Hachimangu”, please download the application form from the web site of Yawata Tourist Guide Association. And the application form should be sent to the below address two weeks before visiting the shrine by post or e-mail or fax. The guide fee is free. However, if you use public transportation in guide, or if you enter a paying facility, we ask you to pay our fee. Please download Application form here (in case of PDF file here).